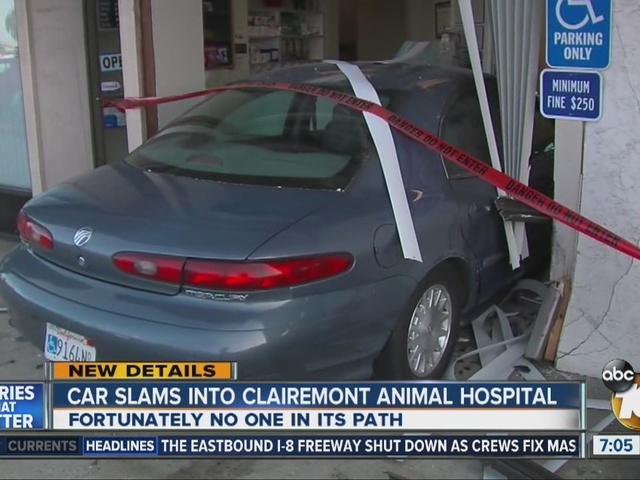 SAN DIEGO - A sedan smashed through a front window and into an interior wall at a Clairemont veterinary clinic Thursday, causing extensive damage and leaving the driver with apparently minor injuries. The accident at Ark Animal Hospital in the 6100 block of Balboa Avenue occurred about 2:45 p.m., according to the San Diego Fire-Rescue Department. Medics took the motorist, who was alone in her car at the time of the crash, to Kaiser Foundation Hospital for an evaluation, SDFRD spokesman Lee Swanson said. Her condition was not released. No other injuries were reported. Receptionist Beth Jamison called the accident terrifying. "We just had a car plow into my work. We were behind the counter and heard a very loud screeching of tires, a huge thud and glass and we ran and this car plowed right up to the front area. It was terrifying," she told 10News. Kathy LeBarron, the driver's daughter, said, "Nobody was hurt! That's the good thing. Thank you, God! Nobody was hurt. It could have been terrible!" A structural engineer was called in to evaluate the extent of damage sustained by the building, Swanson said.